Headquartered in Baar, Switzerland, the history of this global miner and commodities trader has all the hallmarks of a gripping corporate thriller, if anybody were game to write it. Founder Marc Rich was indicted in the US on federal charges of tax evasion and striking controversial oil deals with Iran during the Iran hostage crisis. It is the largest coal miner in Australia, operates a maze of companies and has been under investigation by the Tax Office for shifting up to $25 billion to the tax haven Bermuda via cross-currency interest rate swaps. This particular Glencore entity managed to wipe out all but 0.39 per cent of its total income and on the $108 million recorded in taxable income, paid zero tax. 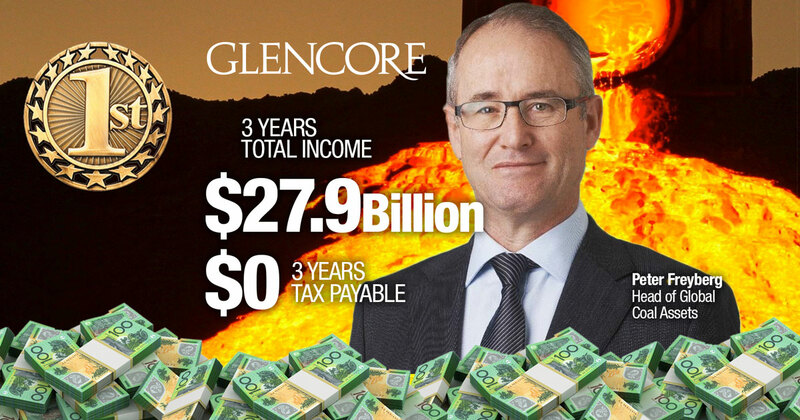 GLENCORE AUSTRALIA INVESTMENT HOLDINGS PTY LTD. Total income $2,556,726,671, tax and taxable income nil. GLENCORE GRAIN HOLDINGS AUSTRALIA PTY LIMITED. Total income $4,132,120,862, tax and taxable income nil. GLENCORE INVESTMENT HOLDINGS AUSTRALIA LTD: Total income $7,787,854,928, tax and taxable income zero. GLENCORE INVESTMENT PTY LIMITED. Total income $18,349,032,015, tax and tax payable nil. GHP 104 160 689 PTY LTD (same ABN as Glencore Investment Pty Limited). Total income $14,196,441,080, taxable income $2,567,672, tax payable $770,302. GLENCORE HOLDINGS PTY LIMITED (formerly GHP 104 160 689. Total income $1,867,473,725, taxable income $146,784,062, tax payable $44,035,219. Public support is vital so that we can continue to investigate and publish articles that tell truth to power. Subscribe with a monthly contribution if you can, see below. Join our newsletter, share and like posts, if you can not make a financial contribute. We are counting down the Top 40 Tax Dodgers. There are now three years of tax transparency data published by the Tax Office and we have used this data to work out which large companies operating in Australia have paid the least tax, or no tax. Notable players such as Google, eBay, Booking.com, Expedia are not near the top of the ATO list. That's because they don't (yet) recognise income earned here; instead, they book Australian revenue directly to their associates offshore. They will be ranked in due course. For other large corporations, and in particular, multinationals, the main steps in avoiding tax are made by reducing their taxable as much as they can; usually by sending it offshore in interest on loans, "service" fees or other payments to foreign associates. So, we have set a threshold. We have included only those companies which managed to wipe out 99.5 per cent or more of their taxable income over three years. Qantas, therefore, is not on this list. Although it made $46 billion total income over the ATO's three years, it was able to reduce this by 99.4 per cent to $264 million, just missing our cut-off. Taxable does not mean taxed. It paid zero. The airline had made large losses which were offset against profits. Many large corporations which have paid zero tax in ATO data, have legitimately made losses and have therefore built up "tax-loss shelter". Many others however, such as ExxonMobil and EnergyAustralia, are on the list as they managed to eliminate all or most of their taxable income by "debt-loading" or other means of aggressive tax avoidance. In response to the censorship scandal which has engulfed the ABC in recent days as the government sought to muzzle its corporate tax coverage, the Tax Office put out a useful statement on its transparency data. In this, the first iteration of michaelwest.com.au corporate tax rankings, we are going purely on the Tax Office data. We will also publish a list of Australia's better corporate taxpayers, those companies who contribute most to the country in which they operate. The Tax Office data is by no means perfect. But sometimes we can identify patterns. In many cases, there are multiple entities with the same ultimate offshore parent reporting. One entity may pay zero tax, another may pay at the statutory 30 per cent rate (even if on low taxable income). We endeavour to be fair in our reporting to recognise these issues. The data also recognises trusts as well as companies. For trusts, it is the members (investors) rather than the trust who are ordinarily required to pay the tax. In many cases however it is fair to recognise trust structures for what they are, as tax is often the main reason these vehicles have been structured as trusts. Companies are welcome to debate their rankings or to touch base to clarify or defend their tax practices. We will append or link these submissions.